Oxford Research was a part of a project team that conducted a cross-Nordic study on the economic influence of standards. The macroeconomic modelling suggest that standardization is associated with remarkable portion of economic growth in the 40-year period covered in the study. The pan-Nordic research team was led by Menon Economics from Norway and alongside Oxford Research offices in the Nordics it also included Social Science Research Institute of the University of Iceland. 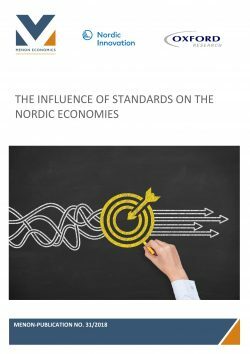 In the report the impact of voluntary consensus standards on economic growth is studied in the five Nordic countries: Sweden, Finland, Norway, Denmark and Iceland. The research used two complementary methods. Macroeconomic approach is an econometric estimation of a productivity model including stock of standards as an explanatory variable covering all five Nordic countries during the examined time span of 1976–2014. Company level approach included a comprehensive business survey on the benefits of standardization covering 1 179 Nordic companies with prior experience from the use of standards and case studies based on in-depth interviews with companies in different industries and countries throughout the Nordic region. The macroeconomic modelling shows that standardization has contributed to increased labour productivity in all of the Nordic countries. The estimates suggest that standardization is associated with as much as 39 percent of the labour productivity growth and 28 percent of GDP growth in the Nordic countries during the period covered in the study. The findings are impressive, but still need to be interpreted with caution. The company level approach revealed that a large majority of the companies (87 percent) consider standardization an important part of their future business plans, supporting the hypothesis that standardization is an important business tool in the modern economy. Overall, standardization has undoubtedly improved economic performance, facilitated improved user experiences, and contributed to safer and more environmentally friendly work environments. An important reason why the positive association between growth in standards and productivity is so robust across countries in the past is most likely that the use of standards addresses specific recurring problems in the market. As technological development continues, yielding new industries with innovative products and solutions, new recurring problems will arise, so there is reason to believe that the importance of standards and their coordinating role in the market is likely to increase in the future.